A recent report released by Transparency Market Research (TMR) states that almost 300,000 people die every year in the U.S. alone due to sudden cardiac arrests, which is also a leading cause of death worldwide. Defibrillators are used for treating cases of sudden cardiac arrests triggered due to ventricular fibrillation, cardiac arrhythmias, and pulseless ventricular tachycardia. The report presents pertinent information and illustrates the factors that are driving and restraining the global defibrillators market. 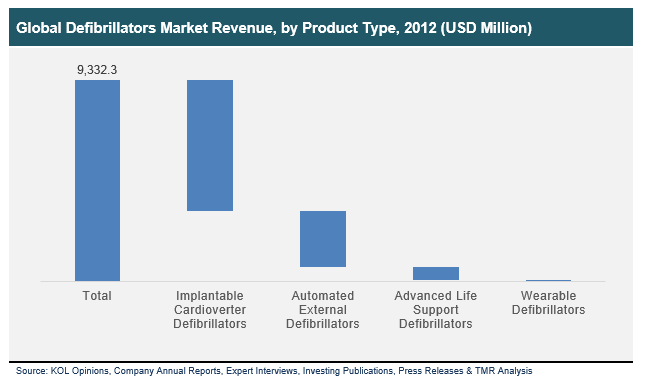 Titled “Defibrillators Market - Global Industry Analysis, Size, Share, Growth, Trends and Forecast 2013 - 2019”, the report is available on the company website for sale. Based on the findings of the survey conducted, the report pegs the value of the global defibrillators market at US$9.3 bn in 2012. Rising at a CAGR of 6.20%, the market is anticipated to reach US$14.2 bn by the end of 2019. Increasing incidence of cardiovascular diseases globally, aging baby boomer population in the U.S., surging demand for installing automated external defibrillators in workplaces, and rising demand from the emerging nations of the Middle East and Asia Pacific are the key factors fuelling demand from the global defibrillators market. The report aims to present a holistic overview of the market to help stakeholders in determining winning strategies and business decisions. Hence, for the purpose of the study, the report segments the global defibrillators market into advanced life support defibrillators (ALS), implantable cardioverter defibrillators (ICDs), wearable defibrillators, and automated external defibrillators (AEDs). Of these, the largest share of the market was acquired by the implantable defibrillator devices segment in 2012, followed by the advanced life support defibrillators segment. Over the last few years, ICDs have gained popularity worldwide as a viable precautionary measure ensuring prevention of sudden cardiac arrests. This is identified in the report as the key factor fuelling the demand for ICDs. In terms of end users, the report segments the market into business workplaces, homes, hospitals, emergency medical services, and community or public access. Among these segments, hospitals held over 90% of the global defibrillators market in terms of revenue. Additionally, the report expects the number of AED installations in both hospitals and businesses to rise over the forecast period, giving a substantial boost to the global defibrillators market. Among the key regional markets for the global defibrillators industry, North America held the largest market share and is likely to continue dominating the market through the report’s forecast period. The report states that the region is anticipated to exhibit a CAGR of 5.70% during the period. Increasing demand from the Middle East and Asia Pacific markets is also expected to keep the demand for defibrillators high over the forecast period.